Imagine traveling back to your parents&apos; or grandparents&apos; young adult years and telling them that in the near future, marijuana would be legal for recreational or medical use in nearly half of the U.S., and that pot smokers would have the option of buying it with a virtual marijuana-themed currency in lieu of traditional money. They&apos;d likely be a little stunned. But that&apos;s what&apos;s starting to happen. Americans are getting around the heinous impositions of the Drug War in increasingly innovative ways. First, states have taken matters into their own hands, passing ballot initiatives to legalize marijuana for recreational or medical use in spite of the federal government&apos;s steadfastly prohibitionist stance. Now, in response to legal marijuana&apos;s biggest challenge — burdensome federal regulations that inhibit legal marijuana shops from doing business with banks — a small group of developers has created an alternative currency called PotCoin. Due to a provision in the Controlled Substances Act, banks that do business with legal marijuana sellers are at risk of losing their deposit insurance or federal charter. In an attempt to mitigate the problem, the Obama administration released a new set of guidelines in February giving banks a tentative go-ahead. Unfortunately the new rules don&apos;t actually offer banks immunity from prosecution. "Guidance or regulation don&apos;t alter the underlying challenge for banks,” Frank Keating, president and CEO of the American Bankers Association, said. "As it stands, banks that provide support for those activities face the risk of prosecution and assorted sanctions." So, marijuana dispensaries are forced to operate on a cash-only basis. For many businesses, this means making themselves vulnerable to robbery. They store hundreds of thousands of dollars in personal safes, and in order to pay taxes, they must carry sacks full of hundreds to the nearest state Department of Revenue. Lack of credit necessitates looking for unusual sources of start-up revenue. For some businesses, the added burdens have forced them to close shop. 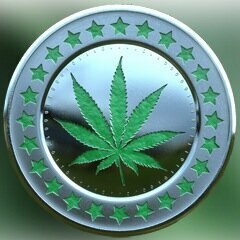 PotCoin is a cryptocurrency, similar to its more well-known sister Bitcoin, that is designed to facilitate exchange between legal pot sellers and their customers in the absence of traditional financial institutions. Like Bitcoin, users can obtain PotCoins by purchasing them on an exchange or by "mining" new ones. They&apos;re then stored on an online "wallet." For many shop owners, these virtual wallets could be preferable to holding cash, since they effectively eliminate the risk of a violent in-store or in-home robbery. Developed by three unknown characters who go by the pseudonyms Hasoshi, MrJones and Smokemon 514 ("Gotta smoke &apos;em all"), PotCoin launched in January of this year and has been generating some fanfare. The /r/potcoin subreddit has, as of Thursday morning, accumulated more than 1,500 subscribers. Several online retailers have reportedly started accepting the cryptocurrency, including Smoke Cartel, Bitcoin Seedstore and Chronic Star Medical. One of PotCoin&apos;s founders, MrJones, told Mother Jones that the idea was a no-brainer: "I guess anyone with an MBA and a love for crypto could have seen the opportunity." Although PotCoin intends to help resolve marijuana sellers&apos; problem of dealing with a risky, unreliable money flow, it may not be particularly low-risk or reliable itself, for several reasons. Volatility: Cryptocurrency expert Jerry Brito, a senior research fellow specializing in technology at George Mason University&apos;s Mercatus Center, cautions that, while PotCoin is "a smart idea," it has risks. Since it isn&apos;t widely used yet, its value will be highly volatile. PotCoin is going to be even less stable than Bitcoin, he said. Lack of accountability: In light of the recent disappearance of $400 million in Bitcoins from Bitcoin exchange center Mt. Gox (and its resultant bankruptcy), investors may be wary of relying on any cryptocurrencies. Federal regulations: The very barrier that PotCoin was created to get around may end up bringing it down. Earlier this week the IRS declared that it will treat virtual currencies like property rather than currency. Mark Williams, a Boston University finance professor, said the IRS decision "reduces the positive economics for bitcoin [and other virtual currency] owners and miners." Even if PotCoin doesn&apos;t end up transforming the way the legal marijuana industry does business, its development is exciting. It signals a step forward for cryptocurrencies, which even Federal Reserve Chairman Ben Bernanke thinks are promising, as they move from largely servicing illegal markets like Silk Road to grey and legal markets. Perhaps even more exciting is the powerful potential that PotCoin demonstrates for new technological tools to move us beyond restrictive government barriers. It&apos;s a brave new world.